Locally know as Kompleks Kraf, this is the cultural craft complex of Langkawi that showcases and sells exquisite handicraft and artwork from Malaysian craftsmen and artists. The craft complex was set up in the year 1966 over 12 hectares of land area. It's so popular that it now draws about 90,000 visitors every year. 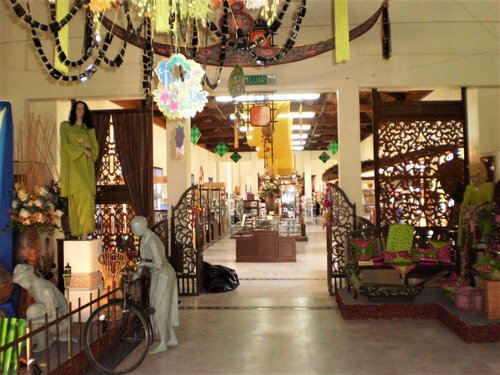 The entry way of Langkawi Craft Complex is from the road Jalan Teluk Yu and opposite to the Shark Bay Beach. So it is located near the northern shoreline of the island. It's a huge complex and the main Craft Complex building has succession of halls with several sections that are designated as museums displaying varieties of intricate art & craft items and reflecting the rich cultural heritage of Malaysia. As you enter through the main door, there is a lobby area and the reception counter is on the right. Talk to the lady at the counter and understand the layout of the craft complex. It's not too simple and unless you know the layout, you may miss out on some sections. Straight ahead of the lobby and also on its left is the Crafts Bazaar which is the sales gallery. Here you will find different kinds of apparel & clothing, gifts & souvenirs, accessories, home furnishing products, utensils and lot more. The sections of museums include Heritage Museum, Custom & Wedding Museum, Islamic Museum, Royal Museum and so on. The museums aim to educate the visitors with the help of exhibits and handcrafted diorama. 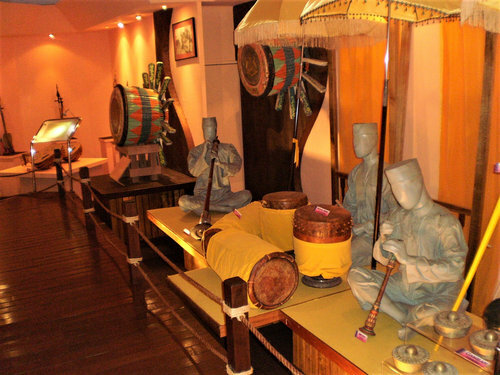 One of the highlights here is the History & Legends Museum where the life story of Mahsuri (a legendary princess who was wrongly accused of adultery and executed) has been depicted with many stunning displays. There is a section demonstrating how local art & craft are made such as songket weaving, wood carving & plaiting, Batik printing etc. There are times when you can personally interact with the craftsmen and learn how they make the products. At the lobby turn left, at the end turn right and you will find the Craft Interactive Area where you can interact with the craftsmen and see the demonstrations. Here they also show how Batik printing been done for the kids. However for a better guided demonstration of Batik Printing, Atma Alam Batik Village is the place to go. Update August 2012: This time I did not find the section for demonstrating Batik art for kids. However, there are some batik printed materials available for sale (like T-shirts etc) at the main hall sales gallery (Craft Bazaar). 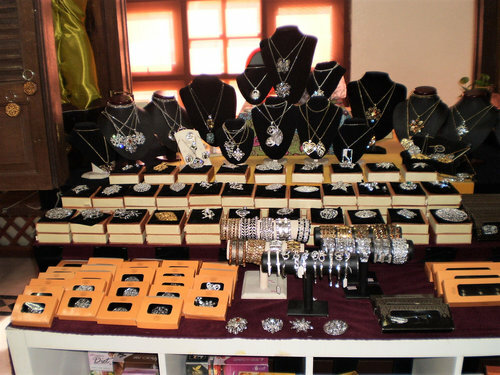 Many other beautiful accessories sold in the stalls. Behind the main craft complex building, there is a Glass Blowing Studio. So don't miss that out either. Although not as professional as the one you see at Murano in Venice, the handmade glass items are however beautiful. They also demonstrate making the glass items in front of you. You can just go and visit, and need not buy any items. Public parking, toilets and meeting rooms are available at the Crafts Complex. Admission is free. The complex is open daily from 10am to 6pm. 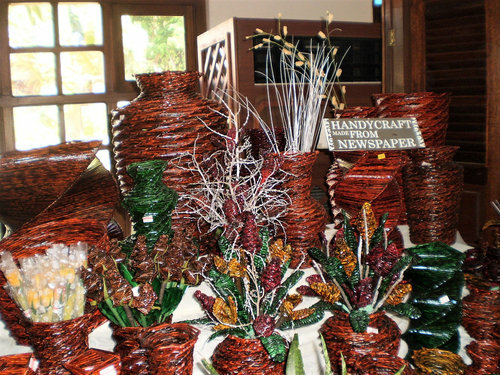 Langkawi Craft Complex is located on Jalan Teluk Yu road opposite to the Shark Bay Beach and close to Black Sand Beach on the northern shoreline of Langkawi. It is about 21kms from Kuah Town and 24kms from the airport. You can come by a taxi, rented car or as part of a tour. See the location in the map below. Use the zoom and move buttons and see the nearby places. 3) Tanjung Rhu & Teluk Yu Guide: Find out all about the area including hotels, restaurants, activities and lot more.